Whenever someone crashes during a ride, the first thing they do is put their hands up instinctively, so it makes sense that you should protect them whenever you’re out riding. There are plenty of motorbike gloves designs to choose from for this purpose, each suited for different types of riding and different seasons. So let’s dive right in and see what the market has to offer. These are the most common types of gloves you can find. The are simple in their design, often made from just leather with no protective padding. These gloves are suited for both warm and cold weather. You can also find designs that have holes poked in them that allow your hands to breathe and prevent sweating. They don’t offer much protection from heavy impact, but will keep your hands safe from scratches and scrapes. They are not able to give that ultimate level of protection because of their lack of padding, but some models have a gel that is sewn in the palm in order to reduce vibrations and stop your hands from buzzing when you’re done riding. For those of you out there who are in love with speed, these gloves are just right for you. They are the most technically correct designed gloves on the market. With protective padding all around, these gloves offer the most protection. They are designed to absorb high velocity impact and are very durable. These gloves are constructed from thick leather, different textiles, and armour padding constructed either from plastic, metal or carbon. 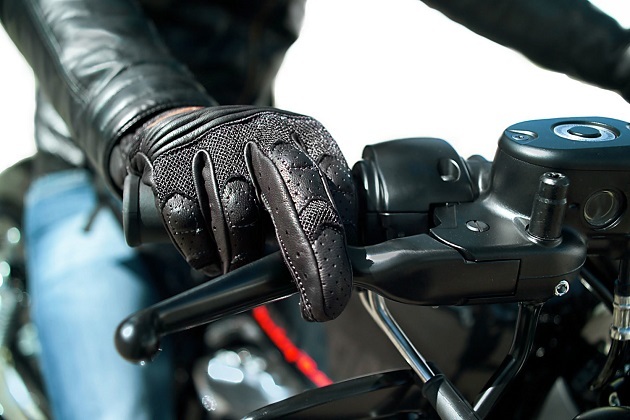 These types of motorbike gloves usually have most protection around the knuckles as that is where the impact occurs the most. Also, they have great ventilation and will not let your hands get too warm. Making sure that your hands are warm whenever you’re out riding in cold weather is very important. Cold hands can become numb and lose their sensitivity which can result in a lot of problems when you’re out on the road. Normal winter gloves might do the trick but they don’t have the same protection. Winter motorcycle gloves are very similar to racing gloves as they offer similar protection. Winter motorbike gloves however, also have insulation to make sure your hands stay warm for long rides even in very low temperatures. But, unlike the race gloves, they do not have good circulation and can only be used in winter.